A sculpture installation has been created for Träffpunkt Stadsskogen – a new and unique district centre characterized by sustainability which was inaugurated on the 28th of August. Pupils have worked with the artist Brynhildur Thorgeirsdóttir and given a personal touch to the installation. The official unveiling of “VISUAL WORLD, a landscape installation”, created by internationally awarded icelandic artist Brynhildur Thorgeirsdóttir. 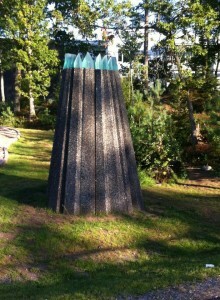 – The new sculptures are something out of the ordinary, says Britta Malmberg, Head of the Department of Culture and Leisure in Alingsås Municipality. The core of Träffpunkt Stadsskogen is formed by the square, the school and the activity hall. Both buildings are built with passive building techniques and the school is the first school building in the Nordic countries classified as a zero energy building. This means that it produces as much energy as it uses in one year. A comprehensive thinking, where sustainability is the guiding-star, characterizes this new district centre. Through their connection to nature, at the same time as they are created by human hand, the new works of art contribute to achieving the ambition that Träffpunkt Stadsskogen is to strengthen the identity of the new town district and to be characterized by the meeting between city and nature as well as by learning. – The sculptures bring Träffpunkt Stadsskogen up to an international level and contribute to a mysterious feeling in the area, precisely as we desired. The materials which have been used are glass, concrete, sand and stone. The sculptures are typical of the artist, since she always has as a starting point the place where the works of art will be located. – It was evident to me that it should be a landscape installation and not just a stand-alone piece of art, says Brynhildur Thorgeirsdóttir, who did pay a visit to the area, but created the works back home in Iceland – all with the exception of one, which was made on site while working with pupils from the Stadsskogen School. It was in the end of May this year, when about twenty pupils of the 2nd grade contributed to the work with ”The Motherstone and Kidstones”, where the children were responsible for the ”Kidstones”; small stones of concrete. Each little stone has its own design, and houses a personal object selected by the children, as well as a piece of special stone, brought for them from Iceland. 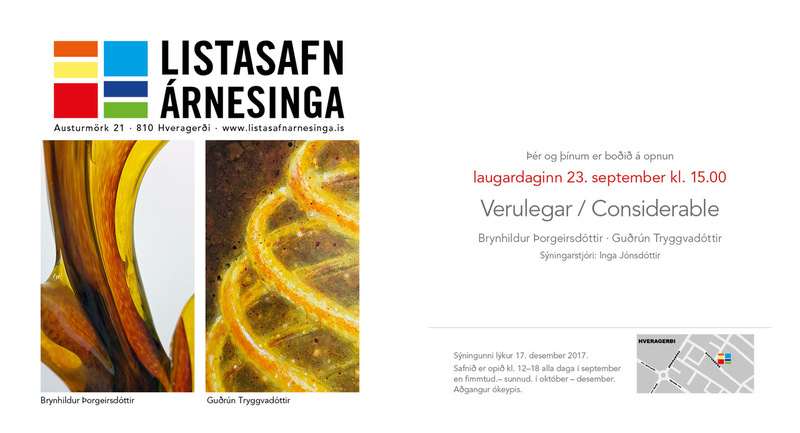 Brynhildur Thorgeirsdóttir has previous experience of working with children and she thinks it is very positive that the pupils participated in the work. – It is great from an educational point of view to involve the children in creating the landscape installation. There were 23 children, eight to nine years old, and they will guide their families and friends in the area. Brynhildur Thorgeirsdóttir thinks that this will also give a sense of responsibility and hopefully create a greater respect for public art. The small stones made by the children have been placed along the school yard. Furthermore, they constitute a link to another one of the new works of art – ”The Mountain”, a big mountain placed along a footpath next to a playground. The third new sculpture, “The Waterstones”, is formed by three units similar to volcanoes, out of which water flows in different ways. The Waterstones are placed in a pond in the square in front of the activity hall. Träffpunkt Stadsskogen is one of the largest environmental investments in Alingsås Municipality, which is at the leading edge in ecological and social as well as economic sustainability. The detailed development plan of Träffpunkt Stadsskogen was approved by the municipal council in 2009. The overall objective stated was that Träffpunkt Stadsskogen should be “a sustainable meeting point for life, movement and learning”. This new district centre is linked to the Municipality’s Vision 2019, which, among other things, states that Alingsås should invest in sustainability and life quality. The municipal real estate company Fabs AB has handled the construction of Träffpunkt Stadsskogen.